Petechia, or in its plural form, Petechiae, is small, red or purple spotting on the skin caused by a minor bleeding from broken capillary blood vessels. These spots are usually 1 to 2 mm in size and are usually used in the plural since a single lesion is insignificant or rarely noticed. 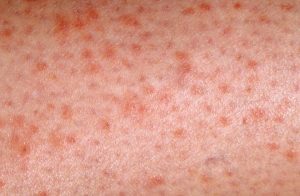 These spots may appear on several parts of the body, including on the arms, legs, stomach, inside the mouth or on the eyelids. Depending on the severity of the spots, they can be minor, while some can present more serious issues. 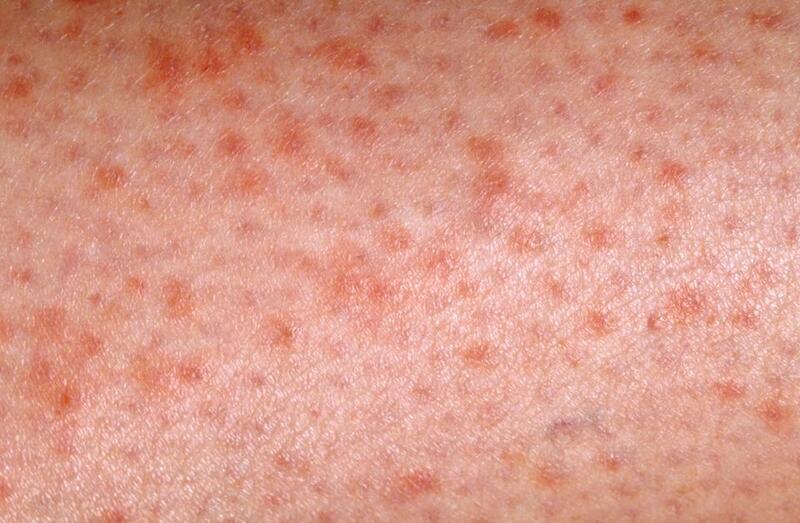 Often individuals can mistake Petechiae for a rash. However, Petechiae are caused due to bleeding and is not similar to a rash. • Presence of discoloration of the skin. The spots can appear on any part of the body. The initial colors of the spots are red, which then turn blue or purple and stay that color. • The skin levels of the spots are not raised. They are smooth. • There is no itching sensation on the spots. • Easy bruising of the skin is associated with Petechiae. • The lesions on the skin are less than 3 mm in size, and they do not change in shape, size or color when pressure is applied to them. In order to prevent petechiae, a person can avoid most of the conditions and causes that cause Petechiae. However, it is not always possible to prevent all the conditions. 1. Washing their hands often with soap and water, and using a non-alcohol based sanitizer. 2. Cleaning counter tops and common surfaces. 3. Not sharing personal items with other people as well as glasses, utensils, cutlery, etc. 4. Applying an insect repellent containing DEET before visiting any woody area or grassy areas. 6. Staying away from any persons who appear to be sick or infected. 7. Take care of the health of your skin, making it more elastic and improving its texture, in order to avoid the signs of PPetechaie. The most common causes of Petechiae are physical trauma, excessive crying, vomiting, violent coughing fits, etc. 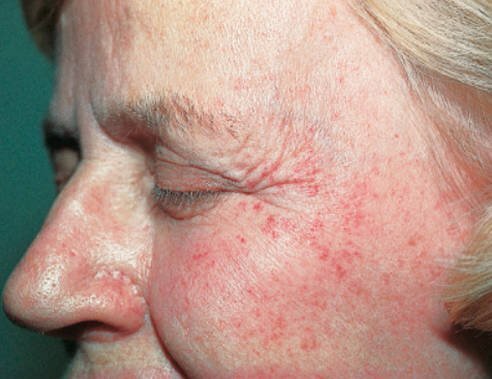 Petechiae can also appear in aging skin. These kinds of conditions cause Petechiae mainly on the face, and around the eyes. 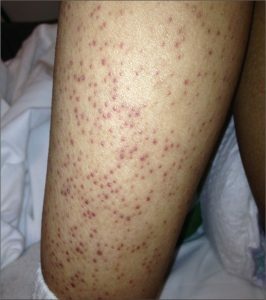 However, these symptoms of Petechiae go away with time. However, on the serious side, Petechiae may also be the sign of a serious blood disorder known as thrombocytopenia. There are a few other disorders which can also be related to Petechiae. In case a person is experiencing sudden bleeding under the skin with spots or having a fever of over 101 degrees, it is important to visit a doctor with these symptoms. Other symptoms such as severe headaches, loss of consciousness, confusion, and dizziness may present with Petechiae. A patient must visit a doctor in case of these symptoms. Petechiae is mostly harmless and can be ignored, as the symptoms and conditions of Petechiae fade away with time and proper treatment, if necessary. However, at times, Petechiae may cause more serious conditions. Certain serious blood disorders can be linked to Petechiae. One of them is thrombocytopenia. These blood disorders can cause a patient to experience excessive bleeding, easy bruising and a low platelet count. 3. Damage to the organs, such as kidney, lungs, spleen, liver, heart, lungs, etc. When the red or purple spots are noticed on the skin, the next step is to diagnose to find out the underlying cause behind these spots. One of the most important factors to consider during this diagnosis is to find out the patient’s platelet count, as this can unveil a host of other factors, conditions, and diseases. • Bleeding time and clotting time in order to determine whether the patient’s body is clotting at the normal measurable time or not. If these normal times are affected, then the tendency to clot blood will differ. The prognosis of Petechiae confirms that if it is caused by natural causes, the symptoms of Petechiae fade over time. There are also many treatment solutions that can assist a patient with the proper treatment of Petechiae. With proper diagnosis, the underlying cause of Petechiae can be discovered. If this underlying condition is treated properly, the symptoms of Petechiae will also fade with time. 1. In case a patient is having allergic reactions due to the effects of a medication or a drug, the patient must leave that medication and watch out for the symptoms of Petechiae. 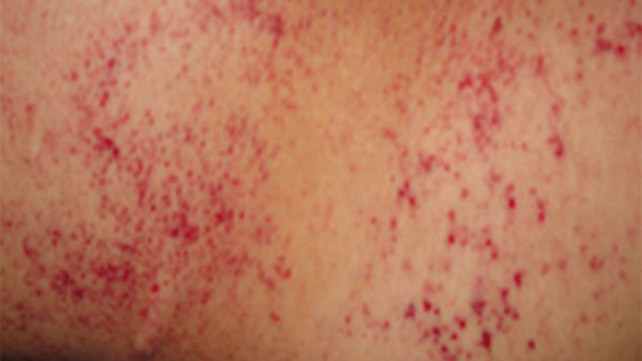 A doctor will be able to detect if medication is the cause of this petechiae. 2. If the symptoms of Petechiae are caused by an injury, this injury site must be treated in order to treat the symptoms of Petechiae. 3. In case Petechiae is caused due to heavy straining, prolonged work, chronic coughing or vomiting, these conditions must be treated in order to treat the symptoms of petechiae. 4. Antibiotics can be offered in case a patient is experiencing the symptoms of Petechiae due to the spread of an infection. This medication will take care of the symptoms of Petechiae along with the eradication of the infection. 5. Platelet transfusion may be able to take care of the symptoms of Petechiae, as often, Petechiae can be caused due to low platelet count in the patient’s body. 6. Surgery can also be offered as an option for the treatment of Petechiae. However, the surgery itself does not heal the symptoms of Petechiae, rather, it treats the condition which is causing the Petechiae. For example, if a patient is experiencing Petechaie due to leukemia, or any other malignant condition, surgery can offer a good management solution for the condition, which will also remove the symptoms of Petechiae. 7. Petechiae can be caused due to deficiency of Vitamin C and Vitamin K. indulging in a diet rich in these vitamins can help alleviate the symptoms of Petechiae. 8. Radiotherapy and chemotherapy can help with conditions of cancer-specific treatments such as leukemia. 9. IV antibiotics are provided to patients with conditions such as sepsis and other severe infections. How to test for Petechiae? 1. Application of ice packs or cold compress can help with the symptoms of Petechiae if it is caused due to broken blood capillaries. 2. Taking certain supplements can help with the symptoms of Petechiae by driving the root cause of the condition out. These supplements can be probiotics, digestive enzymes, protease enzymes, thymus extract and methylsulfonylmethane which can help in preventing Petechaie due to allergic reactions. 3. Certain herbal remedies such as dandelion root, chlorella and spirulina can be excellent in improving liver functions and blood clotting functions. 4. There are certain homeopathy medications which can improve the symptoms of Petechiae. These medicines are arnica montana, acetic acid, Lachesis, Canadensis, sanguinaria, phosphorus, cortisone, etc. What is the difference between Petechiae and purpura? Both Petechiae and purpura are caused due to bleeding into the skin causing spotting and lesions. However, the spotting caused by Petechiae are generally smaller, less than 3 mm in size, which the lesions caused by purpura are larger in size. Yes, it is possible for any individual to experience Petechiae, however, it is seen that those with low platelet count or more tendencies to bruising and allergic reactions experience the symptoms of Petechiae more often. Usually, the symptoms of Petechiae fade away with time as the underlying cause of it fades. If Petechiae is caused due to trauma, injury, excessive vomiting, crying, strain, childbirth, etc. the symptoms fade away with proper time. However if the underlying cause of Petechiae is a serious condition, the condition itself must be treated before the symptoms of Petechiae will go away. Why do medicines like aspirin cause Petechiae? Since certain everyday medications like aspirin contain blood thinners, these can cause the capillaries under the skin to burst and cause Petechiae.